Our newest consumable is designed to permit sampling with auto-pipettors and robotic sample pipetting systems such as the Apricot Design iPipettor. In this workflow samples prepared as liquids in a 96-well plate are positioned on the sampling stage of the robotic pipetting station. The metal frame used to transport and hold the QS-96 in position mounts on top of a flattening stage which pushes the wire mesh against the frame making the distance between the pipette tips and QS-96 uniform. An accurate volume of sample is deposited onto each of the discrete screen positions. 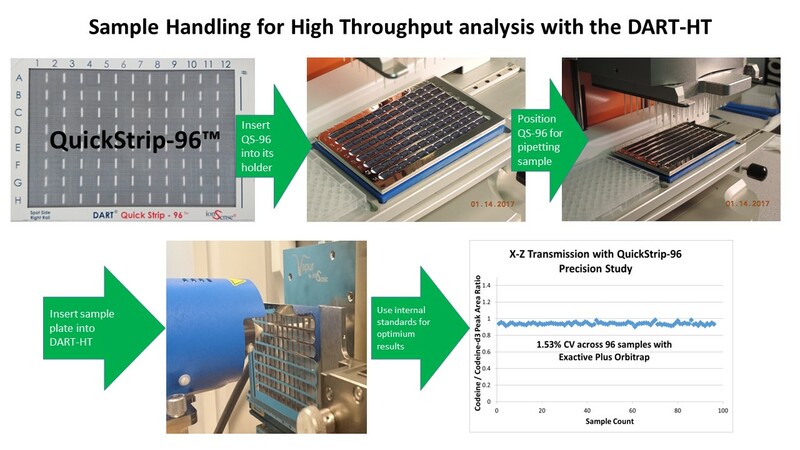 The sample is left to dry in the metal frame and then positioned on the robotic sample arm of the DART-HT for high throughput desorption ionization and MS analysis.